The competition is heating up in the Ring Masters Championships as Metro’s best fight for the right to box in Madison Square Garden and take home a gold championship ring. Tickets to the finals on Friday, April 19 are on sale now here. On Thursday, February 21, the tournament got swanky at the New York Athletic Club, a members-only club on Central Park with an august Olympic history. The sold-out crowd cheered on the 152-pound novice and open fighters. Jayson Capetillo of Brotherhood Boxing won the King of Sting Power Punch Award. The Dana Ford Fight of the Night went to Dzhonibek Nazriev’s unanimous decision against Jose Davila of El Maestro BC. “If I get tired in the ring, I think of everything I went through growing up on a farm in Tajikistan,” said Nazriev, 29, who drives an Uber when he is not at Mendez Gym training under the expert eye of Coach Elliot Ness. On Friday, the action moved to Queens, where the standing-room-only crowd enjoyed delicious arroz con pollo as they rooted for their favorites in the 141, 165, and 178-pound men’s senior open divisions. International Boxing and Fitness in Ridgewood is a colorful storefront decorated with flags brought in by members. “Our gym is welcoming to people of all ages and ethnicities,” said owner and coach Jenny Badillo. It was a skillful night of razor-thin split decisions. Powerful southpaw Orville “Popcorn” Crooks of Mendez Gym captured the King of Sting Power Punch Award. The Dana Ford Fight of the Night went to NYC Cops and Kids’ Bruce “Shu Shu” Carrington’s thrilling decision over Arveontae Dukes of Main Street Boxing. On Sunday, the tournament travelled to Hempstead, Long Island for a matinee at the spacious Kennedy Park Recreation Center, featuring the final novice preliminaries and the debut of the women’s senior open division. Hempstead Boxing prides itself on uplifting at-risk youth in the community, under the mentorship of Coach DC, who honed his pugilistic skills in the Air Force. 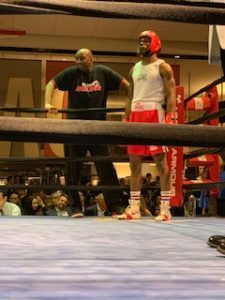 The Dana Ford Fight of the night was a hard-fought 132-pound open bout won by Malique Allen of John’s Gym over Dennis Guerrero, Unattached. The King of Sting Power Punch went to heavyweight Thomas Boatswain for his impressive second round stoppage. Metro was honored to have Ring 8 sponsor Sunday’s action with President Charlie Norkus, Jr on hand to greet the boxers and Vice President Frank Pena in the ring as an official. Ring 8 is a nonprofit that provides assistance to former professional boxers in need. Boxers helping boxers: That’s the Metro spirit! This Friday, the Ring Masters returns to Main Street Boxing in Mount Vernon, featuring the return of Bruce “Shu Shu” Carrington fighting Dey’Shawn Williams for the remaining 141-pound semifinal spot on the Road to the Garden. 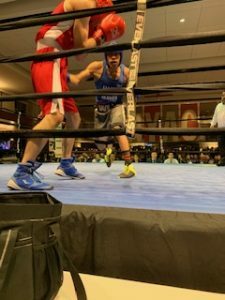 Saturday, Heavy Hitters Boxing in Ronkonkoma hosts quarterfinal action in the men’s 123 and 132-pound senior open divisions, featuring the heavy-handed Harley Mederos, CJ Hernandez and the rest of Metro’s all-star lineup.